In the previous section, written in 2007, I did not include academic references so that I would have a more lyrical text. However, on November 26, 2013, those in charge of the library at Mexico City’s National Museum of Anthropology (MNA) allowed me to take out from the library, and photocopy on the street, a sold-out book in the market that I had tried for years to get. Even before it was published, since 2007 I had made constant telephone inquiries, to the people in charge of the Museo del Templo Mayor, about the manuscript that would be published. Of course: the Mexicans who coordinated the publishing of this major work are politically-correct scholars. There is nothing remotely comparable to “Sahagún’s exclamation” in any of the 598 pages of their treatise. The rationale for the omission can be gathered from the three prefaces to this collaborative work by the director of the Instituto Nacional de Antropología e Historia (“Accepting the reality of the sacrificial practices in ancient Mexico does not mean to rule in favor or against them”); those who coordinate the MNA (“…the Hispanist fundamentalism that sees only the most barbaric aspects of this practice”), and the director of the Institute of Historical Research of the Universidad Nacional Autónoma de Mexico (“…among the non-specialist public often circulates reductionist ideas about it [the Mesoamerican sacrifice]… the papers presented here allow a more accurate and nuanced approach” —this, and the other translations, are mine). Take note that these three persons and the Mexican and non-Mexican anthropologists and historians that contributed with academic papers to El Sacrificio Humano don’t deny the facts about what the pre-Hispanic Amerinds did. What contemporary academics do is abstaining from value judgments about such practices, a subject analyzed in the next section. In one of the first chapters after the above-mentioned prefaces of the book, the archeologist Eduardo Matos Moctezuma presents the archeological evidence of sacrificial rituals: skeleton remains of the victims, stony bases for the sacrifice, the instruments used in the immolations, and more. About it, Leonardo López Luján, the main coordinator of the book, acknowledges in the very first chapter as “having their referents in the historical sources from the 16th century.” This scholar is thus acknowledging that what the Spanish chroniclers saw and recorded in the 16th century is now being corroborated by taphonomy and archeology. López Luján of course uses an artificial passive voice, “fueron muertos” instead of the natural “los mataron” (they killed them) in that introductory chapter when writing about the sacrificial victims. In this postscript of the second chapter, I will summarize some of the facts that the scholars of the treatise offer about how the natives behaved before any substantial contact with the Europeans. Everything indicates that this deposit is the material expression of a mass sacrificial ceremony motivated by the devastating drought of year 1 Tochli, corresponding to our 1454 C.E. and reported in a number of Indian annals. The presence of the Offering 48 in the northwest corner of the Temple fully corresponds with the documentary sources of the 16th century [pages 367-368]. I interrupt the sentence and added italics because this passage refutes very directly the plot of La Santa Furia of my father, as we will see in more detail in ¿Me Ayudarás?, the next book of this trilogy. little slaves offered by the lords and wealthy people; infants purchased out of town, or children of prisoners of war. There are indications, moreover, that the kings and lords to some extent responsible for the smooth running of the meteors destined their own offspring to the téhcatl during droughts or floods, or to get rich harvests [pages 368 & 370]. The article includes taphonomic analysis on numerous cut marks on the ribs of both sides of the rib cage, as well as perimortem fractures produced by the same cutting action on the child’s body. In our view, this body of evidence is sufficient to conclude that the child of Offering 111 died during a sacrificial ceremony in which his tiny heart was extracted [page 378]. Not all child sacrifices were linked to the gods of rain and fertility. Some historical documents reveal that people who were in situations of adversity, or had lost their freedom, or had been suffering a terrible disease, promised to give their children in exchange for their salvation. In other cases, the life of infants was claimed just before the military confrontations [pages 381-382]. In the following pages of the treatise the authors mention the Spanish chroniclers as complementary sources of what recent archeology has discovered, for example the texts by Francisco López de Gómara, Antonio Tello, Diego Durán, and Bernardino de Sahagún. And on page 345 another scholar lets us know that some children’s remains of sacrificial offerings have been recently excavated in what is left of the Great Pyramid; in other sacred edifices, and even beneath Mexico City’s cathedral. Both supplicants offer the enthroned figures an object named “his foot,” yook, perhaps referring to the wooden scaffolding that stands in the stele of Yaxhá. The link to the fires is made clear with the presence of the inflammatory base behind the scaffold. Unlike other sacrificed children, the infant appears to be alive. In addition to the image reproduced in El Sacrificio Humano, see also the illustration at the [top of this blog entry]. The presence of infants over the plates, especially in contexts of way [Mayan word] or co-essences of Maya rulers, indicates that this is a special “food.” Usually, the way was very different food from the food of human beings with emphasis on hands, eyes, bones, and in this case, the soft bodies of children. The presence of women and children indicates that these individuals were not enemy combatants and strongly suggests a sacrificial context, perhaps a sacrifice of wider political significance. The Mayas were not the only serial killers of children in Mesoamerica. In the opening paragraph of “El Sacrificio Humano en el Michoacán Antiguo” Grégory Pereira says that Tariácuri, the founder of the empire of the Purépecha culture that flourished in the Postclassic period, congratulates destiny when learning that his own son would be sacrificed (page 247). This of course reminds me what Nezahualcóyotl did, recounted above. Pereira cites the Spanish Relación de Michoacán as a credible source about how the Michoaque people behaved before the arrival of the Spaniards. Once slaughtered and decapitated, the dismembered body was in the house of the priests and the various parts offered up to the gods and eaten by the priests and lords. Those who were killed at the scene of the conflict were eaten by the victors… After the cannibal feast, the bones of the slaughtered apparently were gathered and preserved in the house of the priests. Once this important work is printed again, those who are skeptical about the factual accuracy of what I said in the previous chapters could obtain a copy of the book. As I said, it is heavily illustrated and has the imprimatur of the most respected historical institutions of Mexico. Compare the real Mayas, as described above, with this postcard: an image taken from a calendar of about 1950 (reprinted in Mexico by ‘gusano de luz’). The Amerind men have not only been idealised—as in real life the losers were always decapitated in that game—; the women are depicted as swarthy yet with more European features. 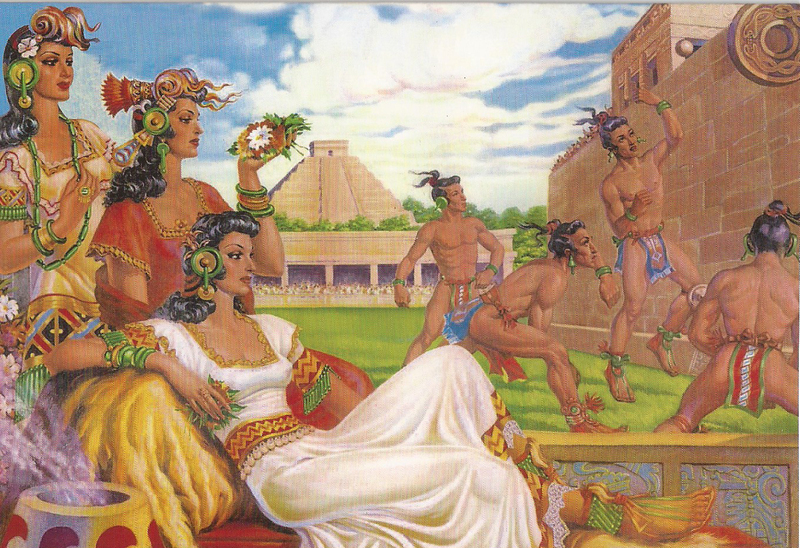 In real life, Mel Gibson got right the facial features of the Maya women, as well as the Maya sport on the arena, in sharp contrast to this idealised postcard. Dear Cesar, you have done what few manage to do, i.e. open an entirely new perspective on history. I am stunned, truly stunned. Like most, I had heard long ago of the bloody sacrificial tradition of the Mesoamerican tribes. And while I knew about the extraction of the still beating heart, it was all ancient history, at least until I read your accounts. Only then did I begin to understand the incredible extent and depth of their murderous madness. I note that cannibalism was never mentioned in the “traditional” accounts I read and most certainly the inclusion of infants as “special food” was completely avoided, no doubt to play to the “sensibilities” of the goyim. After all, how would the average soccer mom react if this history was replayed nightly on the Hitler channel? Even the most apologetic “liberal” cannot swallow (grim humor intended) the idea of child sacrifice and cannibalism. Such barbarism is too far “over the top” for any nation or culture claiming the title of “civilized.” What you have written is perhaps the most repulsive account of a people I have ever read — period. Jews must be green with envy, awaiting the day when they can sink back to this form of barbarism with their coming “third Temple” sacrifice awaiting the building of that structure. Santeria obviously has its roots in this murderous, Mesoamerican tradition. And to think the descendants of these people are being allowed to flood into America. I’m afraid the title of your website falls short in its description. It is not The West’s Darkest Hour, it is the world’s darkest hour; awaiting the final moment when the white man is gone, then what little civility remains among humanity will disappear altogether. The world will soon sink back to its barbaric past, as reigning psychopaths begin openly mass murdering in earnest, torturing their victims before eating their flesh and wearing their skins. And you dear Cesar, have provided their future blueprint for all to read. Well, thank for the compliment. Santería is something that tortures my soul, as it is still done in the big city where I live. I blame the Catholicism of the Counter-Reformation for this. Had Indians been almost exterminated, as your antecessors did at the north of Río Grande, much suffering would have been spared on animals and children here down the South. Instead, the several religious orders that came to the Americas since the 16th century promoted unconditional love for the Indians, and the Church even sanctioned mixed marriages of Spaniards with these Sadists. The rest is history, but no notable intellectual in Latin America that I know dares to speak the truth. Everybody here is an addict of the blue pill. The Truth has no value in this modern (((global civilisation))). The suppression of the destruction of Greco-Roman civilisation in the 4th & 5th Centuries by Constantine Christianity, the suppression of Mesoamerican child sacrifice and cannibalism, the suppression of the true history of WWII. The list is endless. (((Official history))) is bunk. At least there have been writers in Mexico who sided the Spanish vs. the Aztecs, but the real story about the destruction of the Greco-Roman world (as well as WW2) is something that shattered my previous worldview. I find it amazing that most WNsts are uninterested in History. I have a book about the battle of Midway titled “Shattered Sword.” The book is thoroughly documented and makes extensive use of Japanese military records. The result? Outside the fact that a battle did occur on a specific date that involved American and Japanese navel forces, the official version Americans have been told since that battle bears scant semblance to the real history played out. Of course, this is true for virtually all of “the greatest generation’s” WWII history. “Icebreaker” is the first book to explain the rationality behind Hitler’s preemptive strike on the Soviet Union that, until then never made any sense, e.g. opening up a second front during a string of victories on the European front and doing so at the worst possible time, attacking just a few months before the onset of the Russian winter. The Soviets were going to invade Europe with their main objective being the Rumanian oilfields at Ploesti. Had the Communists succeeded the war would have quickly been over, for without that critical oil supply, Germany would have run out of the necessary fuel to pursue the war in a matter of weeks. Later, the much publicized, but costly attacks on those oilfields by the USAAC had almost no effect. Much like the fabled “dambuster” stories about the Lancaster attacks on the Ruhr dams that never had any real effect, as German production was back up just a few weeks after the attack. It is now been quietly accepted FDR purposely set Japan up for WWII, as documented by Rear Admiral Kemp Tolly in his book “Cruise of the Lani Kai.” America had broken the Japanese “Purple Code” well before Pearl Harbor. That code, along with coastal spotters plotting the move of the Japanese fleet across the pacific, made Japanese intentions clear well before the attack. The Japanese had planned to announce a declaration of war just prior to the attack, but the Japanese ambassador was inexplicably delayed until after the attack. This allowed FDR to capitalize on the “sneak attack” ploy to inflame American conscience, virtually neutralizing the public’s previous heavy neutrality stance against the war in Europe. Read Richard M. Watt’s book “The Kings Depart.” Contrast his portrayal of the Weimar Republic with the Jew’s hideous movie “Cabaret” to see if you can find any commonality of that myth with Watt’s reality. Of course there is Hellstorm already covered here and let us neffer forget the tired lie of the hoary old Hallowedhoax. The entire slant of the article paints this as an almost unique occurrence framed with “Gasp! How could these good and gentle people do such a thing? We must find out!” Maybe if they read your book they could figure it out without all the hue and cry.